"The Crow" movie ring; called "Shelly's ring. This is an absolutely stunning ring similar to Shelly Webster's engagement ring used in the cult classic movie "The Crow". It is made out of Sterling Silver or jewelers brass (which looks just like 14K yellow gold) with a 2.8 to 3.0mm Cubic Zirconia in the center. I can put other center stones in if you wish.It measures 5 mm wide. The love story behind this ring is one of the greatest ever told on the big screen and is the reason why I made this incredible ring. Many are so moved by the love story in this movie I just had to make this ring. I will make it in what ever size you would like. Picture 2 is some with other stones and ring sizes. I just love "LOVE STORIES" don't you. I can make this ring in other metals and stones if you would like. 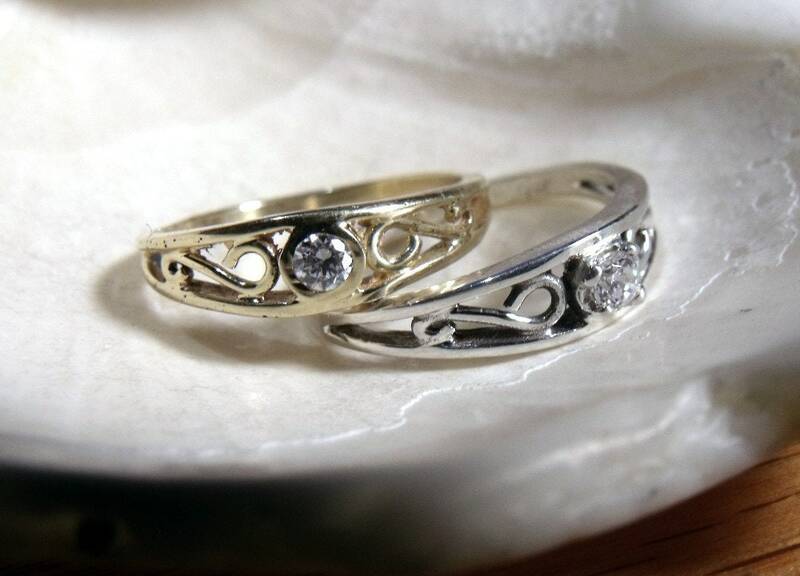 I have it listed in 14K white and yellow gold on Etsy as well. Convo me with any modifications you would like to make. By popular request this is the smaller thinner version which can be ordered in Sterling Silver or Jewelers Brass. This listing is for one ring. Remember " NOTHING IS TRIVIAL" and "TRUE LOVE LAST FOREVER".